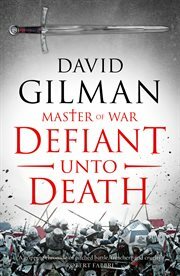 The item Defiant unto death, David Gilman represents a specific, individual, material embodiment of a distinct intellectual or artistic creation found in Evansville Vanderburgh Public Library. France, 1356. Ten years ago, the greatest army in Christendom was slaughtered at Crecy when Thomas Blackstone and his fellow archers stood their ground and rained death on the steel-clad might of French chivalry. Blackstone left that squalid field a knight. Now, Blackstone commands a war band and has carved out a small fiefdom in northern France. But the wounds of war still bleed and a traitor has given the King of France the means to destroy first his family, and then the English knight himself. As the traitor's net tightens, so the French King's army draws in. Blackstone will stand and fight - in pitched battle and in single combat. He will defy his friends, his family and his king. He may yet defy death, but he can't defy his destiny.